The museum at Mehrangarh Fort is a large, world class museum divided into galleries each with a different theme and extremely well maintained by the Mehrangarh Museum Trust. Through the exhibits in the museum, it is easy to form a clear picture of the royal way of living. The museum also has handicrafts shops selling the wares made by local craftspeople. Elephant Howdas: Elephants have always found favour with royalty, due to their majesty, calm temperament and loyalty. The royals in India sat on an elephant in a howdah, to maintain the regal bearing and travel in comfort. 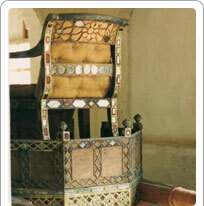 The howda (a wooden framed seat) was normally a two compartment seat, large enough to include the mahout and bodyguards. The howdas were decorated with gold and silver embossed sheets that were a piece of art. The howdas on display at Mehrangarh museum are considered to be the best in India. The pride of the display is a unique and priceless historical piece, the silver howdah of the Mughal Emperor Shahjahan, presented as a mark of special honour to Maharaja Jaswant Singh, along with an elephant and a hundred horses, on 18th December 1657. Palanquins: Palanquins (Palki in Sanskrit) were a popular means of travel for the women of nobility who observed 'purdah'. These palkis had decorated covers and metal screens to peep outside. The display of palkis at this museum is among the most elaborate in Rajasthan. These include palanquins used for both women and men. Men used open palkis to get around. Palkis of particular note are Pinjas, the covered palanquin beautifully decorated with lacquer paintwork and Rajat khasa, a beautiful lotus shaped royal silver palanquin used by the Maharajas. The Treasures: The finest collection of art of the Rathore dynasty that ruled over Jodhpur (erstwhile Mewar) is on display in this room. These include arms, textiles, decorative arts, manuscripts, paintings & headgear including the sword of Mughal Emperor Akbar, the Maha Dol Planquin, embroidered tent hanging, woven tent screens and the printed Jama (coat). This room is known as the Daulat Khana. The Armoury: Armoury from each period of Jodhpur's history, including Sword hilts in jade, rhine horn, silver, ivory, shields studded with rubies, emeralds and pearls, guns with gold and silver work on barrels are on display. Also see the personal swords of Emperors, e.g. the Khanda of Rao Jodha, weighing over seven pounds, the sword of Akbar the Great and the sword of Timur the Lame. The Paintings: The paintings gallery has a collection of the finest of Jodhpur's art. Every ruler encouraged painting in his court and the influence of Rajputs as well as Mughals is clearly visible in the works.